R. Crone, Warhol, New York, 1970, no. 468. R. Crone, Warhol, New York, 1976, no. 817. G. Frei and N. Printz, eds., Andy Warhol Catalogue Raisonné: Paintings and Sculpture 1961-1963, London, 2002, p. 76, no. 57 (illustrated in color, p. 73). Houston, Contemporary Arts Museum, Pop Goes! The Easel, 1963, no. 33. Hartford, Wadsworth Atheneum, The Spirit of Modernism, February-April 1984, p. 102 (illustrated in color). Mexico City, Centro Cultural Arte Contemporáneo, A.C., Leo Castelli y sus Artistas, June-October 1987, p. 40, no. 169 (illustrated in color). New York, Baghoomian, 1988, no. 15 (illustrated in color). 'It seems that the salient metaphysical question lately is "Why does Andy Warhol paint Campbell Soup cans?" The only available answer is "Why not?"' (D. Judd, Arts, January 1963, quoted in Pop Art: A Critical History, S.H. Madoff, ed., London, 1997, p. 268). Reviewing Warhol's work in 1963, Donald Judd asked the question central to Warhol's art, and answered it in the most Warholian way possible. Warhol's Campbell's Soup Cans became instant icons of the artist's work despite being longstanding icons in their own rights- David Bourdon claims that at the time that Warhol began creating these works, an estimated four out of every five cans of soup consumed in the United States was produced by Campbell's. These cans were standard features in the lives of all Americans, piled in pyramids and lining walls in shops and supermarkets throughout the United States. They were not merely icons, but were in fact the building blocks and backdrops of every American's life and had been for decades. When Warhol chose to add the Campbell's soup can to his rapidly expanding pantheon of cultural icons, he managed to tap into a vein of sentiment and nostalgia amongst viewers in a way that his previous works had not. Yet the Campbell's Soup pictures have the appearance of extreme indifference: the stencilled image, placed with scientific geometry at the centre of its canvas, betrays nothing of the artist's life or thoughts. Warhol left no hint of painterliness or of emotion. This apparent indifference was reinforced by the display of 32 Campbell's Soup Cans at the Ferus Gallery in 1962: the assembled pictures were displayed in regular rows, mimicking shop shelves the same can echoed again and again, the only variation being in the names of the various soups. Warhol linked Campbell's soup explicitly to his, and by extension to every American's, life and childhood: "I used to drink it. I used to have the same lunch every day for twenty years. I guess, the same thing over and over again. Someone said my life has dominated me; I like that idea" (A. Warhol quoted in G. Swenson, Art News, November 1963, p. 26). Although the Ferus Gallery display perfectly embodied Warhol's idea of having 'the same thing over and over again', each soup can was intended as an individual work of art. The display of the works together on shelves, engineered with Warhol's enthusiastic approval by Irving Blum, conspired to present them in a way that emphasized their relationship to each other, and yet also discreetly mocked the art market itself, with the paintings appearing as a commodity, the gallery openly displaying its commercial nature. Another dealer further down the street from the Ferus Gallery famously bought some actual soup cans and displayed them in his gallery window with a sign proclaiming 'Do Not Be Misled. Get the Original. Our Low Price - Two for 33 Cents' (G. Frei & N. Printz, eds., The Andy Warhol Catalogue Raisonné: Paintings and Sculpture 1961-1963, New York, 2002, p. 70). Several of the original paintings were sold during the exhibition's duration, including one to Dennis Hopper, and it was only later that Blum decided to cancel on the sales and keep those works together in a group now housed at the Museum of Modern Art, New York. Campbell's Soup Can (Pepper Pot), executed in 1962, is of the same format as the pictures that were assembled and displayed in the Ferus Gallery later that year. In creating these works, Warhol used the stylized image of a Campbell's Tomato Soup can from the back of a Campbell's envelope as the template. He removed the soup title and created different ones to put in its place, including Pepper Pot, recreating the entire series of Campbell's soups, eventually forming the group exhibited at the Ferus Gallery. Campbell's Soup Can (Pepper Pot) was purchased by Mr. and Mrs. Burton G. Tremaine Sr., major collectors of art and considered among the most prominent 'tastemakers' in the Pop market, directly from the studio before the Ferus exhibition took place and before the idea of the cohesive group had even occurred. Their collection contained several important early Warhols, as well as some of the most iconic of Lichtenstein and Johns's works. 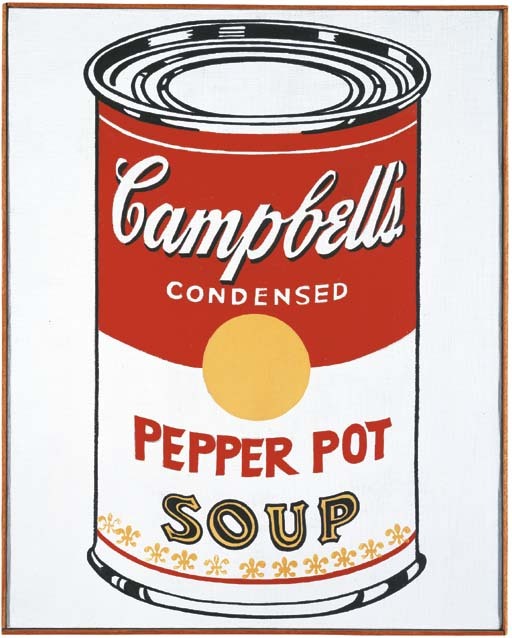 Campbell's Soup Can (Pepper Pot) must have predated the Ferus version of the same flavor, which was probably a replacement in the series as this work was no longer at the artist's disposition. In his Campbell's Soup Cans, Warhol deliberately used an image that was instantly recognized by his viewers, but presented it in a cold, sterile format. It is interesting that Judd, then a reviewer, showed such an interest in Warhol's works, as his rows of Campbell's Soup Cans in the Ferus Gallery exhibition could be seen to preempt Minimalism, a movement which claimed Warhol's later Brillo Boxes as an important influence. However, less than in the Brillo Boxes, Warhol disrupts the appearance of mass-production so central to the Campbell's Soup Cans, smuggling a sense of subjectivity into works that should to all intents and purposes appear objective and inhuman. Campbell's Soup Can (Pepper Pot) manages to be both subversive and celebratory. By appropriating an everyday image and reproducing it in a self-consciously mechanical way with little sign of artistic intervention, Warhol has undermined the process of artistic creation. The controlled appearance of Warhol's silkscreens can be seen as a direct insult to the celebrated Abstract Expressionists. However, by selecting something as recognizable and universal as Campbell's Soup, Warhol managed to create an instantly understandable artwork. Its transparence is akin to Socialist Realism, and yet perversely contains an ultra-American, ultra-Capitalist symbol. At the same time, the very act of enshrining a much-loved product in a painting raises the status of the Soup Can. Campbell's Soup Can (Pepper Pot) is the apotheosis of the everyday. Property from the Estate of Burton Tremaine, Jr.